Browse: Home / 2010 Iowa State Football Season Review – Which Goals Were Achieved? Before the season started we assembled a list of 10 attainable goals for Cyclone football in 2010. We thought it would be fun to take a look back and see how many of the goals were achieved. The Cyclones ended up achieving 4 of the 10 goals. 1. Protect Jack Trice Stadium – Iowa State literally had to protect their home turf during camp when flood waters threatened the Jacobsen Building. Players and coaches had to lay down sandbags to keep the flood waters out. Now they must do it on the football field. ISU will play seven games at home and they must win at least four, preferably five, if they want to reach the post season. The home schedule consists of Northern Illinois, Northern Iowa, Texas Tech, Utah, Kansas, Nebraska and Missouri. GOAL ACHIEVED – The Cyclones notched victories against Northern Illinois (27-10), Northern Iowa (27-0), Texas Tech (52-38) and Kansas (28-16). The home loss that really hurt was the 31-30 loss to Nebraska in overtime. Utah throttled ISU 68-27 and Missouri blanked the Cyclones in the finale 14-0. 2. Win the neutral field game – The Cyclones will travel to Kansas City in week three to take on Kansas State for Farmageddon II. The game was decided by a Kansas State blocked extra point last year with just seconds remaining. The Cyclones need to win the game this year to feel good about bowl opportunities. FAILED – The Arrowhead experiment didn’t turn out well for Iowa State. The Cyclones dropped two close games to the Wildcats in Kansas City. I really believe ISU wins one of these games if it was played at home. 3. Win a road game – Sounds easy enough right? Until you look at the schedule. The Cyclones only have four road games and three of the games are against top ten opponents (#9 Iowa, #7 Oklahoma and #4 Texas). I-State’s best chance for victory comes on November 13th when they travel to Colorado to take on the Buffaloes. 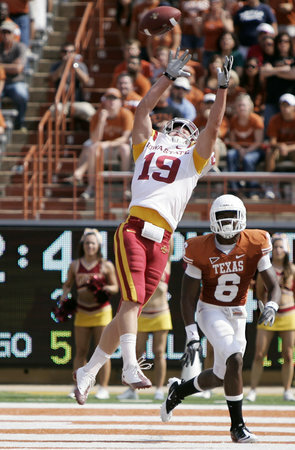 GOAL ACHIEVED – Iowa State shocked the country when they went to Austin and dropped the #19 Texas Longhorns 28-21. Texas went into a tailspin after the loss, but it was the first win ever for ISU over Texas and probably the Cyclones most impressive win of the year. FAILED – Iowa State went 3-5 for the second year in a row. The Cyclones were close to achieving their goal with narrow losses to Nebraska and Kansas State. 5. Beat a ranked opponent – The Cyclones should have several opportunities as six of their opponents currently sit in or just outside of the Top 25. The teams include Iowa, Utah, Oklahoma, Texas, Nebraska and Missouri. GOAL ACHIEVED – Iowa State beat Texas when they were ranked #19 in the country. Northern Illinois finished just outside of the Top 25. 6. Sweep the non conference games – Another tough task. The Cyclones start the season with Northern Illinois, a team expected to contend for the MAC title. A trip to Iowa City is up next to take on a Hawkeye team that some “experts” have in the national title game. Next up is FCS power Northern Iowa who beat the Cyclones in their last matchup and gave Iowa fits last year. The non conference schedule concludes with Utah, a team that has been a bowl champion in each of the last seven years. Win all four of these games and it will be a good year to be a Cyclone. FAILED – The Cyclones were 2-2 with wins over Northern Illinois and Northern Iowa. Iowa State was blown out by Iowa and Utah in the other two games. 7. Win 6 games and become bowl eligible – If Iowa State can accomplish the first three goals above then this goal is accomplished as well. The main goal for all teams, every year is to make it to a bowl game. It is a great reward for the hard work the players and coaches put in and it helps build the future of the program with the extra bowl practices. FAILED – This is the one that hurts the most. Again the Kansas State and Nebraska losses really stick out and ISU couldn’t get it done in the final game against Mizzou. 8. Win the bowl game – Getting to a bowl game is great, but winning the game gives a team momentum heading into the off season. Paul Rhoads is very clear that the goal every year for Iowa State is to WIN a bowl game. FAILED – Can’t win a game you never made it to. 9. Win the Big 12 North – On the surface it would seem to be a tough year to accomplish this goal with trips to Norman and Austin, but the other conference games are all winnable. The only other conference road game is at Colorado, then there is the neutral field game against Kansas State and the rest of the games are at home (Texas Tech, Kansas, Nebraska and Missouri). If the Cyclones can go 5-3, with one of the wins coming against Nebraska, a Big 12 North title is a possibility. FAILED – It seems far fetched looking at this goal now, but with 3 games remaining Iowa State controlled it’s own destiny in the North. Complete the 2 point conversion against Nebraska and who knows what would have happened. 10. 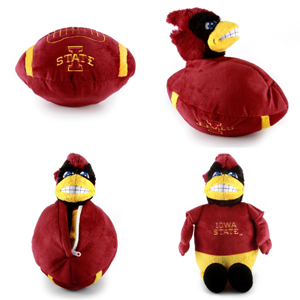 Beat Texas or Oklahoma – Trivia Question 1: When was the last time Iowa State beat Oklahoma at football? Answer: 1990. It has been twenty years since the Cyclones beat the Sooners. Jim Walden’s team topped the Sooners 33-31 in Norman. Iowa State’s all time record against Oklahoma (5-67-2). Ouch. 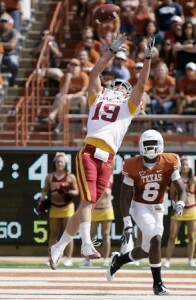 Trivia Question 2: When was the last time Iowa State beat Texas at football? Answer: Never. The Cyclones are (0-7) against the Longhorns. Want people to respect Iowa State football? The Cyclones will get respect nationally if they beat a ranked Texas or Oklahoma team at their house. GOAL ACHIEVED – I honestly thought achieving this goal was a long shot before the season, but the Cyclones checked this one off the list. Iowa State has now beat every team in the Big 12…..and it feels good to say that.